Can Prolactin Cause Recurrent Miscarriages? 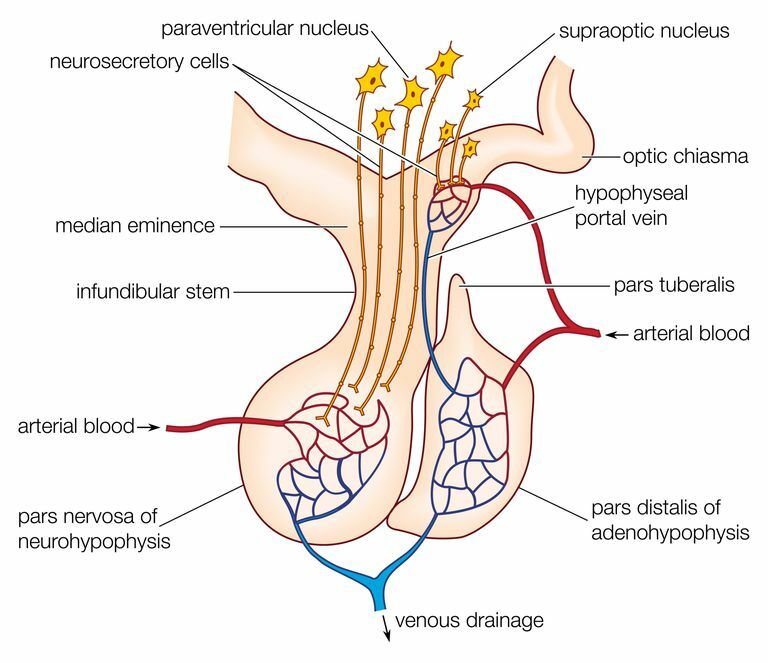 The mammalian pituitary gland, showing the anterior lobe (adenohypophysis) and posterior lobe. If you are researching miscarriage causes or experienced one or more miscarriages firsthand, you may have learned that doctors cannot always explain why they happen. In fact, according to the American College of Obstetrics and Gynecology, recurrent miscarriages have an identifiable cause only about 25 to 50 percent of the time. There are many theories about what causes the other half of recurrent miscarriage cases, but few are conclusively proven. One theory that falls into the latter category is that high levels of a hormone called prolactin may contribute to pregnancy loss. When a high blood prolactin concentration interferes with the function of the ovaries in a premenopausal woman, secretion of estradiol, the main estrogen, decreases. Symptoms include irregular or absent menstrual periods, infertility, menopausal symptoms (hot flashes and vaginal dryness) and, after several years, osteoporosis. High prolactin levels can also cause milk discharge from the breasts. Prolactin is a hormone produced primarily by the anterior pituitary gland, a pea-sized gland at the base of the brain. Prolactin gets its name because it plays a major role in inducing milk production in lactating women. Prolactin levels normally increase throughout a woman's pregnancy, although the levels vary widely in women. Prolactin levels reach their highest level at the time of delivery and then go back to normal around six weeks after delivery (even if a woman is breastfeeding). When prolactin levels are elevated, the condition is labeled hyperprolactinemia, and these high levels can interfere with how a woman's ovaries function. This can lead to menstrual irregularities, infertility, and sometimes milk release from the breasts, even though a woman is not breastfeeding. The most common cause of hyperprolactinemia is a non-cancerous pituitary tumor called an adenoma, but the condition can also occur in some people with hypothyroidism. Prolactin can also be elevated in response to environmental triggers, such as strenuous exercise or stress, and in people who take medications that affect the brain chemical, dopamine. Because menstruation and the normal ovulatory cycle often ceases during lactation, prolactin acts as a natural contraceptive that protects against back-to-back pregnancies. That being said, your body's prolactin levels should not be relied upon as proper contraception. Be sure to discuss postpartum contraception with your healthcare provider. According to this well-accepted theory that high prolactin levels can impair ovarian function, women with elevated prolactin levels who are trying to conceive may experience menstrual and/or ovulatory cycles that are irregular, making it more difficult to become pregnant. When it comes to prolactin and recurrent miscarriages, however, the jury is still out. A few studies have found elevated prolactin levels in women with recurrent miscarriages. What this finding means, however, is controversial. Some people feel that elevated prolactin may cause miscarriages, while others feel that it is too early to say so definitively. Given the interworking of so many different hormones in the human body, it's feasible that an imbalance could cause numerous problems. Since hyperprolactinemia may contribute to miscarriages in some women, some doctors may check a woman's prolactin level and give medication to lower the level if it is elevated. In the case of recurrent miscarriages and prolactin, one older study found elevated prolactin levels in women who had two or pregnancy losses. When these women were treated with a medication called bromocriptine (that works to lower prolactin levels) in their next pregnancy, there was an 85 percent live-born rate compared to the untreated women who had a 52 percent live-born rate. These findings have not been verified in a large-scale study. But, because the treatment is thought to be safe, some doctors test for and treat elevated prolactin when testing women for causes of recurrent miscarriages. The studies that have found a link between high prolactin levels and miscarriage are not large enough to be conclusive. In addition, researchers still do not fully understand the functioning of prolactin in the body, and many feel that it is too early to say whether or not the elevated prolactin levels in women with miscarriages have any clinical relevance. Other factors could theoretically account for higher prolactin levels in women with miscarriages. Some doctors regularly test prolactin in couples with recurrent miscarriages and prescribe medications, such as bromocriptine or cabergoline, to reduce the prolactin levels. These medications appear to be safe to use during pregnancy and are commonly used for women with infertility from hyperprolactinemia. That being said, there are no formal recommendations to test for and treat prolactin in women with recurrent miscarriages. Colao, Annamaria, Roger Abs, David Gonzalez-Barcena, Phillipe Chanson, Wolfgang Paulus, and David Kleinberg, "Pregnancy outcomes following cabergoline treatment: extended results from a 12-year observational study." Clinical Endocrinology Jan 2008. Hirahara F, Andoh N, Sawai K, Hirabuki T, Uemura T, Minaguchi H. Hyperprolactinemic recurrent miscarriage and results of randomized bromocriptine treatment trials. Fertil Steril. 1998 Aug;70(2):246-52. Kaunitz, AM. (January 2017). Postpartum contraception. In: UpToDate, Schreiber CA (Ed), UpToDate, Waltham, MA. Practice Committee of the American Society for Reproductive Medicine. Evaluation and treatment of recurrent pregnancy loss: a committee opinion. Fertil Steril. 2012 Nov;98(5):1103-11. Snyder, PJ. (November 2016). Causes of hyperprolactinemia. In:UpToDate, Cooper DS (Ed), UpToDate, Waltham, MA.